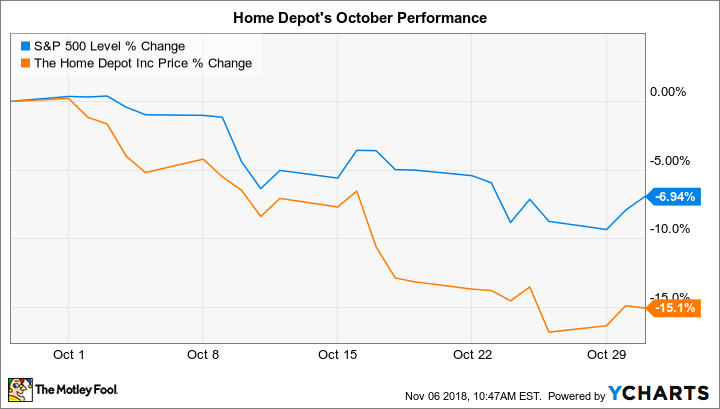 Home Depot (NYSE:HD) trailed the market last month by falling 15% compared to a 7% slump in the S&P 500, according to data provided by S&P Global Market Intelligence. The drop put the home-improvement retailer just behind the broader market so far in 2018, down about 5%. October's decline wasn't spurred by news out of the company. Instead, Home Depot shares fall in concert with rival Lowe's and with many other stocks tied to the health of the housing market. Homebuilders have been reporting slowing sales growth and reduced order backlog, after all, as mortgage rates rise. Investors won't have to wait long to find out whether shifting industry trends are hurting Home Depot's results. The retailer will announce its third-quarter results on Nov. 13, at which point it will update shareholders on important metrics like customer traffic, profit margins, and return on invested capital. As it stands, CEO Craig Menear and his team are projecting comparable-store sales gains of 5.3%, which would be a solid improvement over last year's hurricane-fueled result. Home Depot's short-term outlook might become a bit more cautious, though, if the housing market continues weakening.